Grilling season is almost upon us. Many consumers cook steaks and burgers on the grill. And many people love a rare, juicy steak with a deep pink interior. But did you know that some steaks can be dangerous when cooked less than well done? On April 9, 2012, Representative Rose DeLauro (D-CT) called on the USDA to label mechanically tenderized beef products to protect consumers from foodborne illness. In her letter to U.S. Department of Agriculture Secretary Vilsack, she said that the labeling is important so consumers know how to handle food so it is safe to eat. Mechanically tenderized beef, also called blade or needle tenderized beef, is considered a “non-intact” product. Cuts of beef have bacteria on the surface, but the interior of the muscle is free from bacteria. When a steak is tenderized, needles or fine blades pierce through the surface into the center to break up the muscle fibers. There’s no way to tell from looking at the steak that the meat has been mechanically tenderized because the needle holes are so tiny. This process can introduce bacteria to the interior of the meat. And when that steak is cooked to a temperature less than 160 degrees F, that is, rare, medium rare, or medium-well done, those bacteria are not destroyed, but can make someone sick. The minimum recommended final temperature for intact beef cuts is 145 degrees F, or medium. Mechanically tenderized steaks should be cooked to a minimum temperature of 160 degrees, just like ground beef, because of the potential for bacterial contamination. 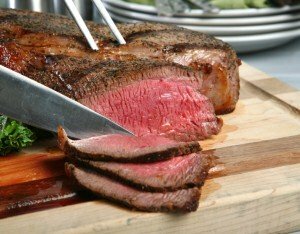 In December 2009, there was a six-state outbreak of E. coli 0157:H7 linked to blade tenderized steaks that sickened 21 people. Nine of them were hospitalized, and one person developed hemolytic uremic syndrome.